FYoung is a bit different from Golden Bride, in which Korean actress Lee Young Ah, or in "Hanoi Bride" actress Kim Ok Bin acting to be VNese. But in Fyoung, Korean Actor/actress played their roles as Korean, Vietnamese played their Vietnamese Characters. Hopefully you'll enjoy & support Forever Young! 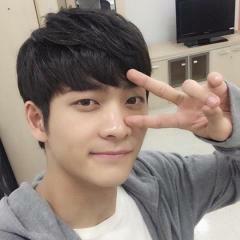 especially actor Kang Tae Oh, he wins... maybe a million girl/woman's hearts through only just 1 drama. He's amazing! The best we've seen this year, surely. It is the heart of my youth. Actually I did not know this film premiered in Vietnam, I watch this drama when the film was shown up to episode 22, one night came across news have posted pictures of Nha Phuong and Kang Tae Oh, I had clicked on the preview how, my first impression was Forever Young playful soundtrack pulsates with images of very funny characters that are ok to start watching it. Despite watching Korean dramas but Forever Young workers knocked me, it became the film that I love most in the present, acting as the main actors were fantastic side, impressive best is a Kang Tae Oh and Nha Phuong, this couple so lovely makes me think they're not acting as they are in real life, chemistry between them was so great! Kang Tae Oh an actor I've never seen before, as well as his 5urprice group, now become my most beloved actor, gentle smile, gentle personality, warm voice, great acting wonderful and lovable personality has conquered me completely. - Do fans of me! Forever young, a good movie and significance. Let's watch and enjoy it fully. Do not miss it I love forever young . Remembering the March event, It's so awkward! Because It was weekend, I had to take my kids along with me. Sadly, the Garden mall was full of TTX's fans, for so, we couldn't enter the auction area although I got auction code *cry*. The last thing I know was the three of us standing in the crowd of 3rd level, looking down on the "super view" of Nha Phuong, Uri TaeOh & Hong Dang's head LOL. But I heard everyone said that TaeOh & NP were so cute together, not to mention Hong Dang's daughter was sooo adorable. Still I don't think that I could ever be that kind of teeny fangirl anymore. Thanks to TTX cast&crew to bring my teenage back . Thank you so...!